Talking about waste management in ASEAN region, three countries are getting the most criticisms just pop up to mind; these three are the Philippines having waste mountains in Manila, Indonesia having plastic sea at Bali and Cambodia being flooded because of the waste congestion along the roads and canals in Phnom Penh. Despite Cintri, a waste management company, collecting monthly fee from inhabitants, Phnom Penh still fights with trash problem. Since early 2016 Ministry of Environment decentralized functions and budget resources to sub-national administrations – municipalities, Khans (districts in the municipality) and cities of the provinces nationwide for the solid waste management. However the question remains – when the function is reassigned to the sub-national administrations, how is the ministry going to manage a monitoring system? There is a serious challenge on how to improve the implementation of sub-national administration and not just end up blaming each other, as recently Sar Kheng, deputy Prime Minister, blamed the Ministry of Environment for flowing the smelly waste water into the river. In the case of waste and solid waste management in Phnom Penh, there is only reciprocal blame while waste remains in the public places and once it rains, water brings along tons of waste into the canals causing congestion and floods in the city. Already last week it happened twice. In some locations houses were flooded and the traffic was paralyzed and congested. The passengers complained and got furious and some of them blamed the government of not paying attention to the congestion and flood in the city, saying that the cause of this dramatic situation is the fact when some lakes in Phnom Penh had been filled and sold out. The environment and sub-national officials blamed citizens for throwing the waste on the streets, and when it rains, the water pushed the waste into canals and caused congestion and flood. The plumbers blamed the government officials and citizens for the waste blocking the water. The blame and scapegoating over the waste problem is not a solution and until now no one has been penalised for littering public places. But most importantly environmental behaviour is a responsibility of everyone: institutions, individuals and voluntary groups to clean up a city altogether. Phnom Penh Municipal Hall should perhaps think to target as a priority meat and vegetable markets in Deum Kor on the border of Chamkamorn and Tuol Kok district. 24 hours a day sellers sell their products and when you pass the markets, you can see so much waste and it is very smelly compared with other places. Every night traffic jams happen because of the sellers on the streets and that is a typical situation in the markets. On the other hand, a good role model is official Kuoch Chamroeun, former Khan Daun Penh governor and currently Kampong Cham provincial governor, who during his tenure, personally led the officials to clean the waste out of the drainage system after the rain. In addition, people should pay attention to role models like Japan. During this year Football World Cup in Russia, Japanese spectators collected waste in the stadium as the match has ended. Would be great if people take this model to apply in Cambodia and clean the waste at the stadium or at the marathon after the event is over. That was so embarrassing two weeks ago, after the 8th public marathon event ended, when runners and participants threw the plastic bottle on the side of the streets while running in Phnom Penh. Most of the runners are educated people, but they failed to think about the environment. The photos of those bottles have been posted and shared virally on Facebook. In this digital era, what is the contribution of technology to environment? Currently, a group of foreigners working in Cambodia, embassy officials, Cambodian youths, and voluntary group cleans waste from riverside and streets in Phnom Penh bi-monthly. Natalja Rodionova, a Latvian, one of the leaders of the voluntary group to clean Phnom Penh city, told The Post that they are foreigners and started this group, because they wanted Phnom Penh city where they live and work now to become as clean as their home cities as well. Every two months, they gather voluntaries of Cambodian youths and foreigners to collect waste in Phnom Penh and they cooperate with Ministry of Environment and Phnom Penh Municipality. They also created a Facebook group GoGreen Cambodia that now has more than 1600 members to discuss the environmental problems and search for solutions. In February, GoGreen team facilitated launch of GoGreen Cambodia App on smartphone and this app is now available in Play Store for Android devices. This app is boosted in the Facebook Page of GoGreen Cambodia to get more support and participation in cleaning of the city. The launch of GoGreen Cambodia was attended by a Phnom Penh Municipality senior official and a senior environment official as well, that highlights importance of the actions in the area of fighting for better environment. GoGreen Cambodia team said that the aim of the digital map is to get people to point out locations in Phnom Penh using pin signs: clean locations have a green icon with happy face and red icons are with unhappy faces to mark unclean places. 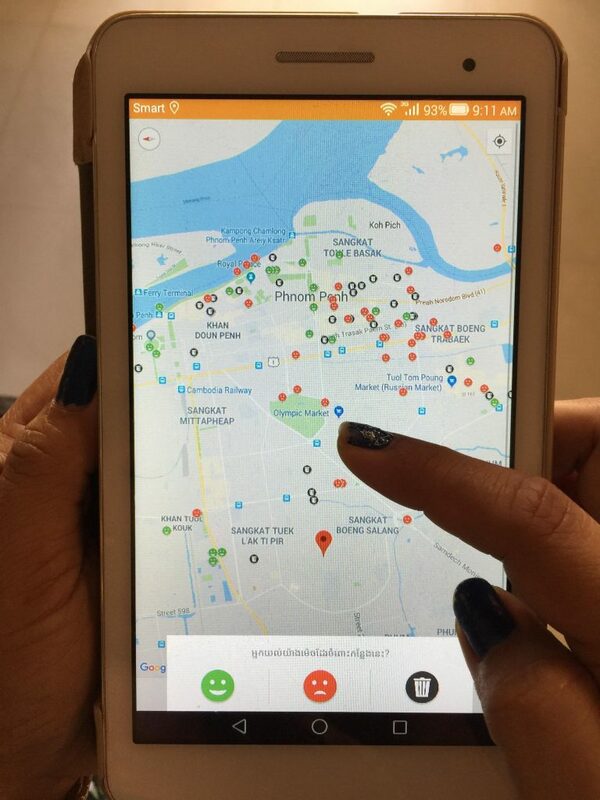 Users can also point location where trash bins need to be installed. Following the pins on the map, the voluntary group will organize a cleanup that locations and unpin the location. The pin sign aims to engage people and help to monitor situation based on the real situation. Users can also upload photos to share with other users. Another target is to provide more information to Phnom Penh Municipality for better solid waste management. H.E. Ngin Lina, General Director of Environment Knowledge and Information General Department of Ministry of Environment, usually supports and participates with the voluntary group cleanup events and she has expressed her satisfaction with GoGreen Cambodia App. Mrs Ngin said that GoGreen is contributing to improving the city environment via providing directions and engaging residents. However, she has suggested further monitoring of waste pins after a place of rubbish has been cleaned; a waste pin should be removed as well. GoGreen team still needs further technical assistance from InSTEDD and support from SPIDER project, Sweden for further development of GoGreen Cambodia App to make it available for iOS users on iPhones so that the number of app users could be increased. In short, accordingly to GoGreen Cambodia data, the number of app users now is over 100 and 172 pins have been created. It means that GoGreen Cambodia follows its dream to improve the environment in Phnom Penh which is supporting the government’s Green City campaign.